That's it from us then. It may not have been a thriller, but we're so glad you could join us. Where else would you actually want to be anyway? Fernando Alonso might have wanted to be elsewhere - check out #PlacesAlonsoWouldRatherBe on Twitter for a great laugh - but we'll see you when the circus rolls into Abu Dhabi. Here's our next and final stop of the 2015 season. Stick it in your diary. Max Verstappen was beyond any doubt so far ahead as my driver of the day. Drive clean, be committed, plan your attack early on and he did that brilliantly I love watching him drive." Sebastian Vettel, who finished third: "For us, we were trying to put them under pressure. we tried something different with strategy, I don't think it was a bad call, it was the right thing to do and in the end we look very strong. The gap was still there, but closer than in previous races. "It is a good feeling to be a lot closer but still, being behind is never where you want to be. This time last year was very different, it was a step into the unknown but I am very thankful for the welcome from the team. A lot of change went on so it was good we had success at the start of the year to boost the whole project. I have hopes for next year, but Mercedes are strong, they know what they are doing but to cut a long story short, we are coming." Lewis Hamilton, who finished second: "I think I was looking for all options. It is not just about racing, strategy comes into it but at the end of the day Nico drove a fantastic race. He has been doing a fantastic job in qualifying. Of course I have to think in my mind what is the progress of the season, what has been the changes. Some changes to our car since Singapore seems to have shift the direction of the waves so I just need to see why that is and get back on it. "I was pushing like crazy, though. I had had nothing left." Some deep stuff from Nico Rosberg here: "It is a world that changes all the time, you need to adapt, it never stays the same. "They make in the factory whatever they think is the fastest but you can influence the small bits and pieces when the car gets to the circuit. That is going better. "I am just enjoying the individual races. I want to kickstart it to next year by ending this one a positive note." Nico Rosberg has a bit of a joke to begin with: "It is an honour [to have as many wins as David Coulthard], that was my life's target. "I had the pace today. I am happy with that this weekend. "I have been working at it. I have been pushing hard to try and improve. I have worked at everything and it is paying off. I am driving quicker now. There is not one specific thing. I am driving better than ever." Nico Rosberg is told of Niki Lauda's theory that his improvement is psychological. "It's not a head thing," he says. So that scuppers that theory. What does Niki Laudu know about motor racing anyways? Mercedes' non executive chairman Niki Lauda: "First of all drivers have problems with their heads. Lewis had the better start but now Nico is back. It is a head thing, if you feel happy you go quicker. Whoever wins the last race has a little benefit going into December." Careful with your driver there Mercedes. Nico Rosberg perches on the floor to have some photos taken, and then gets up with a distinct limp. Just a touch of cramp though. More water, less champers, Nico. "McLaren need to get their heads together and, with their partners, deliver a package." McLaren's Jenson Button, who finished 15th: "No-one wants to be a lap down, but there were some positives in terms of next year. It does feel like we are going in the right direction." Coulthard has also just made the outlandish claim that Emus cannot walk backwards. Turns out it's true. Is there anything David does not know? "Kimi Raikkonen is the fans favourite, he has a huge following, but he was massively behind again this afternoon. He is performing like a number two." Suzi Perry, David Coulthard and Eddie Jordan are forced to move Forum on down the pit lane as a cheeky Ferrari engineer gets his drilling on. You can watch on the Red Button and online. Nico Rosberg's first season in F1 was 2006, when he competed for Williams and look at the hair he had then, just look it. It's like something out of Dawson's Creek. Force India's Nico Hulkenberg, who finished sixth: "We have secured fifth in the constructors championship. That shows the progress we are making. All heading in the right direction." Felipe Massa on the investigation into Williams' tyre pressure: "I didn't feel anything wrong. My race was a disaster all weekend. I don't even know what's happened." And a little bit more admin. Williams have secured third spot in the constructors' championship, meaning Red Bull take fourth and Force India fifth. We should note that Nico Rosberg has wrapped up second place in the drivers' championship with this win. The German is on a roll - five straight poles and two back-to-back victories. The FIA are currently in a meeting with Williams, they're having a chat about tyres. It's complicated, but essentially the rear tyres of the Williams were over the pressure threshold. More news to follow. But he's not any more. Eddie got his man. Verstappen says he was actually a bit angry in the early stages of that race with the lack of progress. Eddie Jordan is off. He's gone to chase Max Verstappen, who was having a chat with Dutch television. As good as Senna and Schumacher? Here you go. Lots of love for Max Verstappen from Eddie Jordan and David Coulthard. "It was absolutely fantastic, judged to perfection. He just continues to impress," says Coulthard about his performance. EJ agrees: "I have compared him to Schumacher and Senna. I feel at this stage of his career he is that good, what do you think David?" "You are on the money," says Coulthard. We're not done yet folks. Plenty of more reaction to be found on the Forum over on the Red Button or right here online. Max Verstappen, who finished 10th: "We were really liking a lot of top speed today. It was a very tough race, I was attacking but there were people attacking behind me. To come away with one point was the maximum we could have done today I think." The David Coulthard-Max Verstappen bromance is in full swing. More details to come on that. Sebastian Vettel, who finished third: "It was a good race for us. I was hoping at the start we could do something but it was not possible. Overall we have to just admit that they were just that bit quicker. Hopefully we can again be a bit closer in the next race." Mercedes boss Toto Wolff: "Nico is very strong. He controlled the whole weekend. "I think he will spend some time over the winter to find out what made him perform so well at the end." The Brazilian fans start chanting the name of Ayrton Senna, possibly entertaining themselves after a slightly uneventful race. Lewis Hamilton, who finished second: "I had good pace you just can't overtake here. I killed my tyres and it is a shame because it is such a great track but you can't get close enough to race. "It would be good if you could do a bit of overtaking here. I am here to race and when you both have to do the same order then if there are other strategies let's take a risk. I just couldn't get close enough, so it was relatively boring following in a tow. "Nico has been doing fantastically well." "I could have worked that out myself," says Nico Rosberg after Martin Brundle tells him he needs be better in the first half of the season. Race winner Nico Rosberg: "It was a great weekend for me here, of course everything is relative because of what happened in Paris. "It was a good challenge from Lewis but I was able to control the pace. We saw Lewis dropping off a lot with degradation and that confirmed it was important to take care of the tyres. "I am pushing now and I was pushing earlier in the season. I don't have an explanation for why now but just want to keep on going." Here's Mr Moustache. Lap it up my friend. Your facial hair is one of the winners of the day. Nico Rosberg receives his trophy as the carnival music hits. Lewis Hamilton finds his smile and sprays a sprinkling of champagne on to his team-mate. "Nico Rosberg's walk out on to the top spot was actually a little muted." Nico Rosberg's prize? He gets to share the moment with a bloke with a tremendous moustache. Apparently it's the Mercedes team member's 50th birthday (moustachioed man, not Nico). "Not to make excuses for Hamilton but the demands for the champion are greater in the off season. We will see a lot of Hamilton at award ceremonies and the like. I know from my old team-mate Mika Hakkinen he said he was exhausted." Lewis Hamilton is slower to remove his helmet, and isn't chatting. Rosberg is all smiles. Nico Rosberg stands on top of his Mercedes and raises a pair of clenched fists. You suspect he feels he is proving a point. "Nico is a happy man and he is ace-ing it right now." So the top five ends up exactly as it was on the grid. Nico Rosberg, Lewis Hamilton, Sebastian Vettel, Kimi Raikkonen and Valtteri Bottas. Nico Rosberg: "Wooooooooooooooooooo. Yeah guys awesome." We're not sure how many 'Os' were in Rosberg's wooo there. It was quite a few though. It might not have been thrilling to watch, but you have to give Nico Rosberg credit for that run. It was perfect. Completely error-free. Nico Rosberg wins the Brazilian GP. "Some vintage passes from Max Verstappen. He's got to be one of the drivers of the season!" Nico Rosberg has six seconds on Lewis Hamilton going into the final lap. "I think Ferrari have definitely given us an insight into their development programme, they are very much focused on next year. They have picked up a few wins, that was the target." Oh yes, he's done it. This is Max Verstappen's race. The 18-year-old continues to flourish. The Dutchman gets alongside Pastor Maldonado in the home straight and the Lotus can do nothing to stop Verstappen climbing into the points on Turn One. I'd have happily just watched a Max-cam all race. "Pastor Maldonado is in all sorts of trouble with the tyres and Max Verstappen is all over the back of him. The trump card that Maldonado has is the Mercedes engine." We're coming into the final few laps and it seems the mid-field is where any late action might occur. Keep an eye on Max Verstappen - he has Pastor Maldonado in his sights. Great to see Felipe Massa in among the points on his home track. The Williams man struggle in practice but is up in eighth. He's unlikely to catch Daniil Kvyat though. Yup, very much so. Nico Rosberg and Lewis Hamilton go through traffic and the latter comes out almost three seconds behind. "It is looking tough for Lewis Hamilton." Sebastian Vettel: "It looks a little bit darker now." Dark clouds there may be, but Ferrari reply that it is going to be dry until the end. People talk about how F1 is all about the cars. Max Verstappen is exposing the flaws in that theory all by himself. Max Verstappen is single-handedly providing today's entertainment. He has a nibble at Felipe Nasr and the two almost come together on the inside. The Dutchman has another go - nails it. Mercedes enginer to Lewis Hamilton: "Aero data looks fine, no problems." Hamilton has lost half a second of time - the gap to Nico Rosberg about 1.5secs. Nico Rosberg: "Don't talk anymore!" Where are your manners, Nico? I guess he does have a race to win. Lewis Hamilton: "I've damaged my floor I think." That message comes after he experiences a bit of lock-up. Difficult to see exactly where he might have damaged the car. Nico Hulkenberg: "It is getting darker." Showers on the way? Helmet slipped down? Who knows? If we've learned anything today, it's to NEVER talk to Jenson Button in the braking zone. McLaren engineer: "Stick with target minus four, target minus four..."
Jenson Button replies: "Stop talking to me in the braking zone! If you've got to speak to me you've got a whole straight to do it." Lewis Hamilton wants this so much, but is there anything he can do? Nico Rosberg has not put a foot, or wheel, wrong. Their boss Toto Wolff is looking on anxiously. The gap is falling. Around a second now between Nico Rosberg and Lewis Hamilton. "Interestingly we are hearing that Jenson Button has been told to let Fernando Alonso past. Alonso was a long way behind Button." Mercedes engineer to Nico Rosberg: "A lot of traffic to get through, want to keep that gap to Lewis. "Lewis has stopped, he is two seconds behind you." Nico Rosberg comes in for a textbook stop. Lewis Hamilton follows suit. The gap is 1.5secs. Quite the battle going on between Daniel Ricciardo and Sergio Perez in the mid-field. All the action has been around Turn One and once again it produces an overtake as the Red Bull man is up to 11th. Take note everyone. Pastor Maldonado is back out after his five-second penalty. Felipe Nasr is in front of him, and will be his first target. "Lewis Hamilton throwing down the gauntlet with a fantastic lap time." Lewis Hamilton notches the fastest lap of the race. Is there some action to be found in this race yet? This has reminded me I have a bag of crisps I need to crack open. Consider it done. Sebastian Vettel: "I'd like to stay out a bit more, the tyres are good." Vettel sounding like he's asking for permission to stay out for a couple more pints on a night out. And why not? He's having fun. "It's hard to see how Hamilton can win this." Lewis Hamilton is making very small in-roads to that gap on Nico Rosberg. It's at around 2.5 seconds now. A bit of a slight on the name of Britain's mobility scooters there. Button is currently running in P15, Alonso in P16. "Sad to say it is standard operating procedures for the stewards [regarding Pastor Maldonado], they probably don't even change the name on the computer when it comes to applying the penalties." A quick decision from the stewards on Pastor Maldonado. He gets a five-second penalty. I think the Venezuelan has a bet with his mates that he can pick up a penalty every other race. Pastor Maldonado goes past another Sauber - this time Felipe Nasr. No touching. No crashing. No drama. Oh well. "Nico Rosberg has a bit of traffic to find his way through." "Potential problem for Massa - right-rear tyre temp 27C above permitted max before start but pressure only 0.1psi above minimum." With both Mercedes back out, Lewis Hamilton is three seconds behind Nico Rosberg. It's the German's to lose. Mercedes engineer to Nico Rosberg: "Nico we are going Plan B.
Rosberg: "What happened to Lewis at the end of the stint, did his tyres degrade? Mercedes engineer: "Affirm, affirm. He could not keep the pace." Pastor Maldonado has driven into Marcus Ericsson at Turn One. Very out of character for the Lotus man that. It doesn't look like there is damage - but the stewards are going to have a look. Check that. It WAS hammer time. Hamilton's team saw an opportunity as Nico Rosberg pitted. But Hamilton hits traffic and decides he'll come in too. Mercedes engineer: "OK Lewis, hammer time." "That pass was the mark of a champion. Nobody does that, he did not give the position up. He is prepared to take the risk. Can you imagine when we see him in a car racing at the front?" This is why they call him Mad Max. Max Verstappen has Sergio Perez in his sights coming into Turn One. The Dutchman gets a great line and inches ahead by the time they swing back into Turn Two. He takes P9. How old is he again? 12? Toro Rosso's Carlos Sainz, who retired on the first lap: "I think I went to do the first practice start and the engine suddenly turned itself off. I started from the pitlane and when I left the pits the engine suddenly lost power. It is like the go-karting days when you brake and it locks up completely. Hopefully I won't get a penalty for Abu Dhabi. In a rookie season it is difficult to take as you want to do well and finish races." We're not being spoiled with drama as it stands. Daniel Ricciardo has pitted again as he continues his one-man mission to climb through the field. He's 17th - so it's not going great. Mercedes team radio: "OK Lewis, the only other option is to either protect P2 or go for the win - stretch this stint long and put us on a tyre offset at the end." This, my friends, is known as Plan C.
"Interesting to hear from Mercedes who say converting to plan B is a bad idea because of the Ferraris and Hamilton is saying get me on a different strategy." What of the Ferrari? They're quietly going about their work. But they could be influencing Lewis Hamilton's strategy. His engineers tell him that 'Plan B' might not be a wise move because of the presence of Kimi Raikkonen and Sebastian Vettel. What is Plan B? No idea. "A tidy little battle between the McLarens but they are tucked in behind Nasr and unable to do anything about it." "We have consistently seen Lewis Hamilton take a shallower line down to most corners. It is taking a lot out of his tyres and, at the moment, Nico Rosberg is just too good." McLaren misery continues. Jenson Button is taken on the outside by Felipe Nasr, much to the pleasure of the home fans. Lewis Hamilton is told by his team that his tyres are holding up well. That gives him the incentive to pile the pressure on Nico Rosberg. "It's impossible to follow on this track," he tells his team. Here's a shot of the pair coming close in Turn One right at the start. Pastor Maldonado has slotted his car into reverse. Daniil Kvyat and Felipe Massa both slide past the Lotus, which is losing pace. 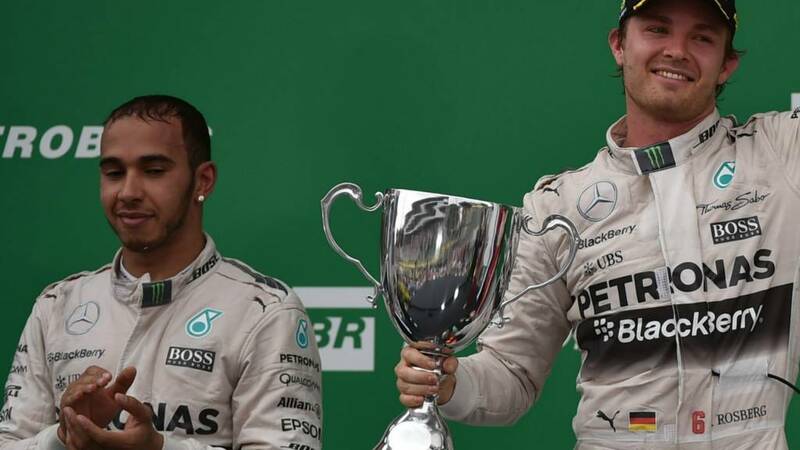 "Lewis Hamilton is just hoping for Nico Rosberg to succumb to the pressure. Lewis has the instinctive pace in the race and if one small chance opens up, he will take it." "My tyres are not going to last," says Lewis Hamilton. He had to be more aggressive to catch Nico Rosberg, and he's feeling it on the tyres. Now, things are going interesting out front. Lewis Hamilton has cut the gap right down on leader Nico Rosberg to less than a second. The Briton has considered having a go - no big moves yet though. Interlagos is renowned for its short laps, but we're rattling through them. Pastor Maldonado is the only man yet to have made a stop, but he might like to think about making one, as Nico Hulkenberg surges past him on the home straight to move to sixth. If you draw your eyes to the top of this image, you'll see a Lotus going wide. Do not spoil the Strictly results for me! "Not enough. Nico Rosberg is just passing our commentary box. I think the gap when Lewis comes back out will be about the same, if not slightly more." Not a perfect stop for Lewis Hamilton either. In fact he comes out further behind his team-mate than before the pair of them pitted. The gap is around 1.7 second. So that puts Lewis Hamilton out in front, but he's set to pit. It seems Nico Rosberg's stop was a tad longer because of traffic in the pit lane. "A slow stop for Nico, we know they can deliver two-second pitstops so Hamilton's fate could well lie in the pitstop." "Box, box, box and remember left-hand magic," is the message to Nico Rosberg. Can they pull a rabbit out of the hat? Daniel Ricciardo's race from last could be a fun one today - proper video game stuff. He's come through the two Manors and now has Romain Grosjean in front of him, after the Frenchman's pit stop. Plenty of pit action. Men in boiler suits everywhere. Nico Hulkenberg, Daniil Kvyat, Felipe Massa and Romain Grosjean have some early work done. Romain Grosjean is just half a second behind the Toro Rosso of Max Verstappen. That battle for 10th is one to keep an eye on. "It seems that the track has evolved a bit more a year on. We know degradation is higher on the soft, yellow-walled tyre but it is not as bad as last year. We can expect them to go longer, the question is just how far? I would expect that the final stint will be longer to try and get that track position." Romain Grosjean moves up to 11th with an overtake on Brazilian Felipe Nasr and is putting the moves on Max Verstappen. Meanwhle, Nico Rosberg has opened up 1.3 seconds on his team-mate Lewis Hamilton. Fernando Alonso had to go into the run-off on Turn Two after the green light. That's Daniel Ricciardo in the pits early doors. Not exactly what you need when you've started 19th on the grid. "It was not a bad start from Lewis Hamilton but Nico Rosberg aced it. Hamilton came in behind Rosberg, picked up the slipstream and then tried to get around the outside." A look back at that start then. Lewis Hamilton swung in behind Nico Rosberg and then slingshotted on the outside into Turn One. Nico had just enough though. Behind them, Valtteri Bottas moved up a spot by going past Nico Hulkenberg - he almost hauled in Kimi Raikkonen too. "You can see the black lines on the track, whatever the issue Carlos Sainz had it has seized the rear end. Part of the car is still on the track and they may well have to put out the safety car." Carlos Sainz makes his own lonely start from the pits and moments later he's on the side of the track. It seems his rear axle has locked up and that brings out a yellow flag in the second sector. Lewis Hamilton has a go straight from the line but Nico Rosberg holds him off. The top five maintain their places through the first two turns. Everyone apart from Carlos Sainz is out on the formation lap - and now they get lined up. "I'm looking at Carlos Sainz's car now. He is sat in the garage and a race against time to get him ready for the start. They have had four goes at starting his engine and it keeps cutting out. It cut out when he did a practice start and the team is still scratching their heads now." These fans at Interlagos are ready? Are you? We have all our lovely extra camera streams for you, remember. Click on the 'live coverage' tab to select. Can Hamilton break his duck? Lewis Hamilton has spoken many times of how Ayrton Senna is his inspiration. But he is still yet to win in the homeland of his hero. He will look to change that in two minutes. It took him eight attempts, but Ayrton Senna finally won in Brazil in 1991. And he did it with a dodgy gearbox and a dodgy shoulder. What a guy. “Within Red Bull, there were never very high hopes for the upgraded Renault engine that has been introduced this weekend. Renault has promised it would give about 0.15 seconds in lap time, but in fact Daniel Ricciardo, who is using it, was slower on the straights with the same downforce levels, as team-mate Daniil Kvyat, who is not and was 0.095secs slower as a result. It turns out the engine actually has less power than the old one. Renault are saying to Red Bull it is not optimised yet, and the guidance is that it opens up development opportunities for 2016. But it has escaped no-one that, just as the beginning of the season, a supposed improvement in the Renault has actually led to a drop in performance. Toro Rosso's Max Verstappen, starting from ninth: "It will be very hard for the tyres, it will be difficult to see how many stops we have to do, between two or three but it will be a tricky race to manage the tyres for sure. We will try for two stops, but we have to anticipate what the others are doing." There's quite a buzz around Toro Rosso's Max Verstappen right now. Yesterday, Eddie Jordan predicted he would be joining Ferrari within two years. A lot of you enjoyed the Dutchman's interview with our very own David Coulthard. Feel free to watch it again right here. Or, if you have never seen it before, you can watch it right here. (They're both the same link, obviously). Carlos Sainz has been towed back to the garage. Reminds me of the time my Ford Focus had to be towed off an embankment after I turned on the ignition with it in gear. Anyway, the Toro Rosso will have to start from the pit lane. Speaking of the grid, there are grid girls AND boys out there today. A wonderful display of gender equality. Felipe Massa to secure his third Brazilian victory? Unlikely - but possible. Use #bbcf1 to throw your predictions our way. We've just had minute's silence, which had already been set in the schedule to remember those killed in road traffic accidents. But it was also an opportunity to consider the events in Paris this weekend. Paris-based Romain Grosjean held a French flag as Interlagos fell silent. David Coulthard spots Bernie Ecclestone on the grid and after pulling him back from a Ferrari positioning itself on the grid he grabs a word with the F1 supremo. "I think Nico is going to win," says Ecclestone. "It is just a case of who makes the best start here, pole is not the best place to start." "Problems for Carlos Sainz on the to-grid laps. Stuck at the exit of the pit lane." "That will be disappointing for Carlos. Hopefully they can get it started and back on the grid." Ah, not great for Carlos Sainz. He's broken down on a warm-up lap. The Toro Rosso driver was set to be 10th on the grid - we'll wait to see if he'll be starting at the back. No soggy bottoms please, James. Morecambe and Wise. Cannon and Ball. Ant and Dec. All of them can step aside. Yesterday a new comedy duo was born - they're called Button and Alonso. Qualifying wasn't great yesterday for Jenson and Fernando - particularly Fernando. Both men went out in Q1, and Alonso spent most of qualifying sunning himself in a picnic chair. The pair saw the funny side though - and snuck on to an empty podium to the amusement of the Brazil crowd. You can watch their little skit here. "This is one of the races that really captures you because it is right in the centre of Sao Paulo. Great legends have raced here and I loved coming here. A great track." Those legends include Ayrton Senna, of course. More about him in a classic GP recap later on. Wherever you are, whatever you're doing, give us your thoughts on today's action using #bbcf1 on Twitter. Emerson Fittipaldi's hand in the birth of the Brazilian GP is immeasurable. The first competitive GP in the country, won by a hometown hero. Wonderful stuff.